Far away in a tropical land, where few of us will ever visit, there lives a plethora of exotic and enigmatic animals that would be at home in a book on Victorian expeditions and grand discoveries. Scaly pangolins, pygmy elephants, and a species of small rhinoceros that is covered in brown fur represent a drop in the ocean of the immense biodiversity living in the beautiful natural habitats of Indonesia and Malaysia. I hope you are conjuring a heart-warming image in your mind of lush green rainforests; perhaps a huge orange cat with black stripes disappearing into the undergrowth as birds and monkeys join forces to belt out a warning chorus, letting everything nearby know of the tiger’s presence. Now raze the trees, set fire to everything, destroy the animals, and in the ensuing barren wasteland grow acres and acres of plantations. All for an ingredient called palm oil. What is this magical substance that is worth wiping out entire species of plants and animals for? It’s an edible vegetable oil that is in everything from soap and toothpaste, to cookies and chocolate bars. Pick up a consumable in any supermarket and you’ll probably be holding palm oil. The substance is this omnipresent in the western world and yet 85% of the entire world’s supply of palm oil comes from plantations in Indonesia and Malaysia alone. That should give you an idea of how much of these two Southeast Asian countries has been, and continues to be, burnt to the ground in order to produce palm oil. That biodiversity we spoke off before is hanging on by its finger tips in smaller and smaller… and smaller… pockets of forest. 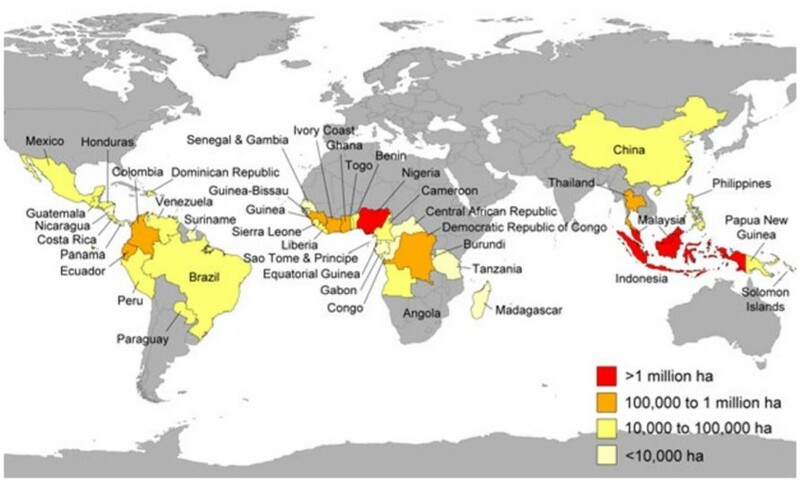 World map showing countries affected by large-scale clearance of natural habitat for producing palm oil as of 2006 (FAO 20076, via Koh and Wilcove, 20087). Further to the suffering of the natural world, in many areas, indigenous peoples are forced to abandon their forest homes and their traditional ways of life, in order for the land to be purposefully destroyed. Indonesia has one of the highest deforestation rates in the world. What happens to these displaced people? Many of them are forced into working on the plantations as slaves. This includes child slavery. I am sure you have heard of Conflict Diamonds? Conflict Palm Oil is just as inhumane. If you need further persuasion that palm oil is bad news, the carbon pollution produced by palm oil plantations is a MAJOR player in the line-up of human induced villains that are hurtling our climate out of control. Climate change is a normal, natural phenomenon. What isn’t normal is the speed at which it is occurring due to human activity. It is changing so fast that animals and plants can’t keep up, they can’t evolve or adapt fast enough. So they’re choosing option B and going extinct instead. 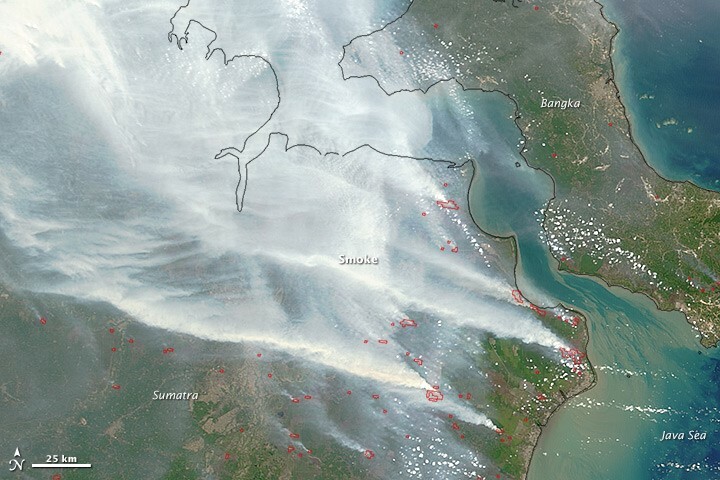 In 2015, smog produced as a direct result of fires used in palm oil production was so thick in Sumatra, Indonesia, that it caused air pollution levels to spike in neighbouring Malaysia and Singapore. (NASA, 2015). Unfortunately avoiding palm oil is very difficult as companies are wise to ethically minded consumers and disguise its use by calling palm oil all manner of things. Some alternative names at least give you a clue as they include the word palm, such as; Palm Kernel, Palm Kernel Oil, Palm Fruit Oil, and Palmate. Many other more devious iterations manage to avoid the word palm altogether; Glyceryl, Stearate, and Stearic Acid, for example. Very annoying. A network of organisations including NGOs, companies that grow and harvest palm oil, and companies that use palm oil in their manufactured goods, set up the Roundtable of Sustainable Palm Oil to address the situation. The RSPO, as it is known, is working towards a future where all palm oil is sustainably sourced by creating ‘a set of sustainability standards’ for palm oil production. Products that contain sustainably sourced palm oil carry the RSPO logo. However, there are mixed reports on how effective the RSPO is, with some conservation groups saying that palm sources are not ‘policed’ meaning companies can sign up to the RSPO and produce products containing palm oil under the banner of being sustainable, when they may well not be sustainably sourced at all. But wait, it isn’t all doom and gloom. Many conservation organisations have been working on our behalf for years to explain to producers of consumables the immense destructive force that is required to produce palm oil. As a result, many large brands have released statements, policies, and goals surrounding the reduction of palm oil in their products. It’s great that conservation-minded people in the know are changing the way companies are using palm oil, but there is still a way to go and sadly, if we don’t act quickly there won’t be any wildlife or habitats left to save. There are less than 100 of those small fluffy rhinos I mentioned left in Indonesia and Malaysia, and there are 0 anywhere else in the world. Habitat destruction is a major, major factor in their demise. Is this devastation worth the convenience of not checking the ingredients on your lunch? If it contains a [LINK] buzz word [LINK] but doesn’t state it is sustainably sourced, why not put it back and pick something else? If you’re feeling really motivated, why not tweet, Facebook, email, snail mail or carrier pigeon a note to the manufacturer to say you chose a different product today because theirs contained palm oil that isn’t sustainably sourced? Yes of course you can make a difference. A single grain of rice can tip the scale after all. 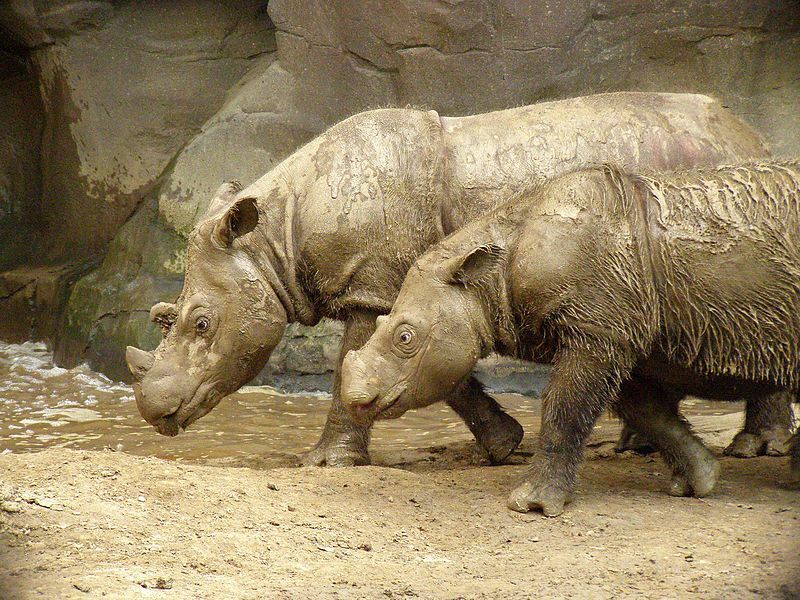 Sumatran rhinos at Cincinnati Zoo. (By Charles W. Hardin, image in public domain). 7 Koh, L. P. and Wilcove, D. S. 2008. Is oil palm agriculture really destroying tropical biodiversity? Conservation Letters 1 pp 60–64.